Relax and rejuvenate as you experience some of the most luxurious spas afloat. You will be transported into a state of pure bliss as you are massaged, detoxed, groomed and hydrated. Your body and soul deserve some pampering. Immerse yourself in a spa-focused getaway with wellness programs and dedicated healthy dining menus. Inhale the eucalyptus-infused steam, in the Persian Garden, at this world class tranquil spa. You will view the ocean from heated relaxation chairs as a tropical misty rain shower blends in with the steam. Perhaps you might like to detox your body with a heated seaweed mask steeped in essential oils. Aromatherapy oils are used in exotic rituals to condition and nourish manicures and pedicures. If you want to release blocked energy, why not try the ancient Chinese art of acupuncture. Your partner is not forgotten, as there are suites reserved where you can enjoy a full body massage side by side. A spa concierge will provide product information and make bookings for guests. Never will you experience this level of relaxation. It will be easy to forget you are at sea as you enter the two-level Asian inspired spa complete with Buddhas, bonsais and rice paper walls. You can book a complete spa package which includes meals, specially designed cabins and opportunities to sample a wide variety of spa treatments. This spa feels like a sanctuary where qualified therapists will treat you to ayurvedic therapies and you also have unlimited use of the thalassotherapy pool. A Japanese tea ritual completes each spa visit. Seabourn takes the luxury spa concept to a new two-deck high level. Unique Spa Villas are available featuring a balcony, living area and oversized bathtub. Each session in the private Spa Villa goes for over two hours. You can attend a yoga class with a Kinesis Wall, take a dip in the extraordinary hydrotherapy pool and then finish off with an invigorating Thai floor massage. There is also a Finnish sauna and thermal suite. Fitness professionals can take you through a complete health and wellness program which includes body composition analysis, nutritional advice and personal training. 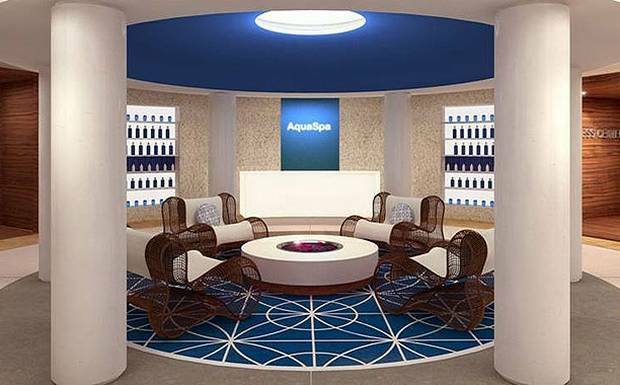 Take a tour of the Norwegian Cruise Lines spa and see what is available for your relaxation and rejuvenation. A full range of grooming for men is also on offer. For glowing radiant skin, why not try a 24 karat facial or indulge in a stimulating exotic lime and ginger salt glow. After washing away the salts, you are then treated to a full body massage. There are treatments to suit everyone, including cellulite reduction, botox, seaweed massages and acupuncture. Make sure you pre-book your spa treatment before sailing so you don’t miss out! Your spa experience will take care of every little detail, leaving your skin and body replenished and vibrant. Relax, enjoy, indulge yourself a little, or a lot, and feel like you’ve never felt before. A cruise spa is the ultimate in peaceful relaxation with state of the art therapies and equipment.